Travel to Nicaragua as part of a Kalamazoo Valley Habitat for Humanity volunteer team. Habitat for Humanity Nicaragua is our tithe partner. Since 1993, we have provided funding to help build 103 homes in this Central American country. If you would like to be added to the list of potential participants for a future Global Village trip, contact Executive Director Charlie Robertson 269-344-2443, ext. 212 or crobertson@habitatkalamazoo.org. Kalamazoo Valley Habitat for Humanity is a tithe partner to Hábitat para la Humanidad Nicaragua. Nicaragua is the second poorest country in Latin America. Our tithe partnership began over 25 years ago. To date, Kalamazoo Valley Habitat for Humanity’s support has helped build 103 homes in Nicaragua. We have tithed over $330,000 from our unrestricted funds to help Habitat families in developing countries realize the dream of homeownership. Right now, almost 80% of the Nicaraguan population lives on less than $2 a day with living conditions that are unimaginable to most of us here in the United States. Kalamazoo Valley’s first Global Village volunteers traveled to Nicaragua in January 2005 as part of team organized by Lakeshore Habitat for Humanity in Holland, MI. In March 2013, inspired by seven members of the WMU Campus Chapter, we put together our first Global Village Trip and sent 12 volunteers on a 9-day journey to build hope and homes for families in Nicaragua. Volunteers provide both the funding and the labor for the project and walk away with a life changing experience. We have organized a Global Village team annually since that time. To learn more about Habitat for Humanity Nicaragua, visit the Habitat for Humanity Nicaragua web page: www.habitatnicaragua.org. To foster a relationship of solidarity with the people of Habitat for Humanity Nicaragua. To build a home in partnership with a future homeowner family and Habitat for Humanity Nicaragua. To learn first-hand about the history, culture, and current situation in Nicaragua. To be witnesses and advocates to others for Habitat Nicaragua upon our return. Must be willing to work as a member of team dedicated to service under the direction of the Habitat for Humanity Nicaragua staff. Minimum age: at least 16. (If under 18, must be accompanied by an adult). 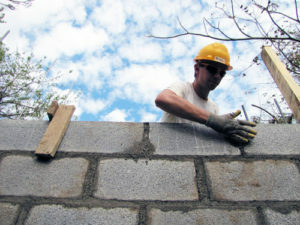 Each team member is responsible for his/her own expenses and makes a donation to provide the materials to build the home. Should be in general good health and capable of heavy, physical work in hot weather. Must have up to date tetanus immunization. Approximately $1,600.00* plus airfare (*based on a team of 12) includes food, lodging, ground transportation in Nicaragua, medical insurance, cultural activities, etc. Subsidies are available to help reduce costs.